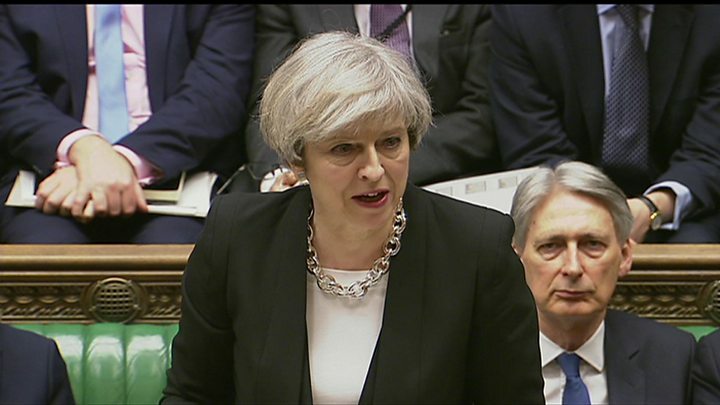 The Westminster attacker was British-born and known to the police and intelligence services, Prime Minister Theresa May has revealed. She told MPs he had been investigated some years ago but was not part of the current intelligence picture. Eight arrests in London and Birmingham followed the attack that has left four dead - PC Keith Palmer, Aysha Frade, Kurt Cochran and the attacker. Mrs Frade worked at a London college, while Mr Cochran was from Utah, in the US, and visiting the capital with his wife Melissa, who is in hospital with serious injuries. According to a family statement, the couple had been celebrating their 25th wedding anniversary and were due to return to the US on Thursday. PC Palmer was a 48-year-old father, who was an unarmed member of the parliamentary and diplomatic protection squad, with 15 years' service. A JustGiving page set up to raise money for the family of PC Palmer reached its initial target of £100,000 within 24 hours, but the target has since been doubled. 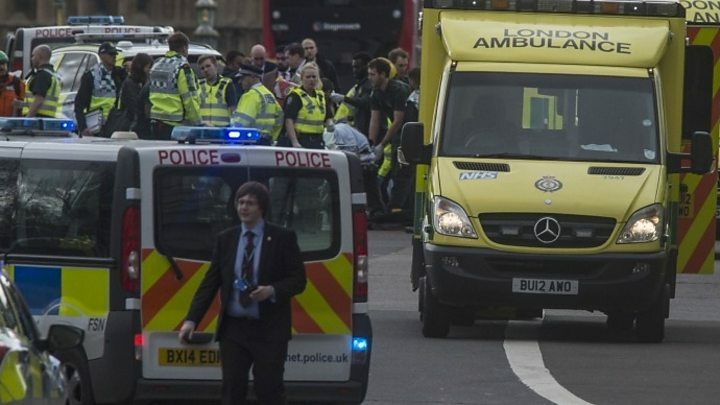 In the attack on Wednesday afternoon, a man drove a car along a pavement on Westminster Bridge, knocking down pedestrians, creating panic and leaving dozens injured. After crashing his car into railings, the attacker ran towards Parliament where he stabbed PC Palmer. Armed police shot dead the attacker in the grounds. Seven of those injured are still in hospital in a critical condition. A further 29 had been treated in hospital, police said. Car hire company Enterprise said the vehicle had been rented from its Spring Hill depot in Birmingham. Prime Minister Theresa May paid tribute to PC Palmer saying: "He was every inch a hero and his actions will never be forgotten." She also said one of three police officers who had been injured as they returned from an event to recognise their bravery was in a stable condition. She told MPs, many of whom had been caught up in the commotion on Wednesday: "We will never waver in the face of terrorism." 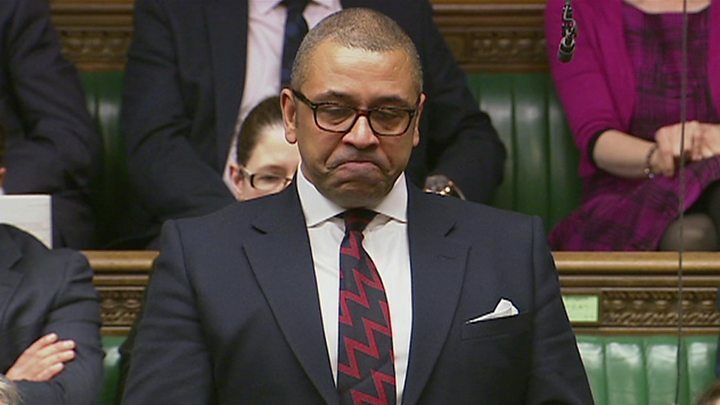 An emotional James Cleverly MP asked Mrs May to consider recognising posthumously the "gallantry and sacrifice" made by PC Palmer, who he knew from his time in the Army. The so-called Islamic State claimed through its news agency that the Westminster attacker had been a "soldier of the Islamic State". Mrs Frade worked at a London sixth-form college just a few hundred metres from Westminster Bridge, which has now reopened. The principal at DLD College, Rachel Borland, said she was "highly regarded and loved by our students and by her colleagues". Mrs May said 12 Britons had been admitted to hospital and other victims included three French children, two Romanians, four South Koreans, one German, one Pole, one Irish, one Chinese, one Italian, one American and two Greeks. Thierry Terret, who is in charge of schools in Brittany, said the three injured students were not in a life-threatening condition and were on their way home. Media captionPrime Minister Theresa May said MPs were meeting as normal to show "we are not afraid"
The prime minister's carefully-worded statement that the killer was once investigated raises more questions than it currently answers. It appears that the individual was discounted as a "peripheral figure" on the edge of some other operation. She didn't say whether that means he was considered and discounted for good reason by MI5 intelligence officers, investigated for a criminal offence by detectives or even ever arrested. However, she also stressed he was not part of the "current intelligence picture" - and that means he wasn't currently on the radar at all. This points to the very difficult dilemma faced by security services combating these kinds of threats. Every day they have to prioritise, or triage, who to pursue and who to discount. People who were once a threat change their thinking. They grow up, have kids and settle down. MI5, meanwhile, is tasked with focusing on those they know of with the most advanced plans. Some of those they discount, or temporarily turn away from, later turn out to be more dangerous than initially thought. They include the ringleader of the 7/7 bombings and one of the two men who killed Fusilier Lee Rigby. Intelligence is never a complete picture - it is not even like a jigsaw with missing pieces. It's a case of trying to interpret fragments of information that rarely amount to a whole. Earlier, Acting Deputy Commissioner Mark Rowley said seven arrests had been made during raids in London and Birmingham - an eighth was announced several hours later. The BBC understands that searches and arrests have been carried out in Forest Gate, east London, Wales, Surrey and Sussex, as well as in Birmingham. "It is still our belief - which continues to be borne out by our investigation - that this attacker acted alone and was inspired by international terrorism," Mr Rowley said. "To be explicit, at this stage we have no specific information about further threats to the public." The Queen said her "thoughts, prayers, and deepest sympathy" are with all those who have been affected by the "awful violence"